Our line-up of all the grand bodegas based around the famous Estación at Haro is now complete. Roda is the youngest and possibly the most dynamic of this illustrious coterie, more in the “modern” camp than their neighbours, favouring French over American oak. Their excellent 2010 vintage really underlines the quality of their range. Cirsion is the estate’s top wine, made with fruit from selected parcels of older Tempranillo vines. The wine has been aged for nearly two years in 100 percent new French oak. A nose of wood smoke and bitter chocolate cedes to a voluptuous palate, these descriptors complemented by notes of mint, graphite, sous-bois and sweet spice; in other words, multi-faceted and full of potential. 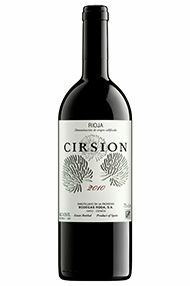 The Wine Advocate - The 2010 Cirsion is pure Tempranillo from selected vines where the ripeness of the grapes give some special characteristics to their tannins, which they consider need a shorter aging time in wood and make for an exuberant and approachable wine. This is something they started in 1995 when they discovered that some plants produced grapes that had more wine than fruit aromas. With some time they decided to make a wine with these grapes where they thought the wine is half-produced in the grape already, and requires less time in oak to polish its tannins, something they cannot do every year. 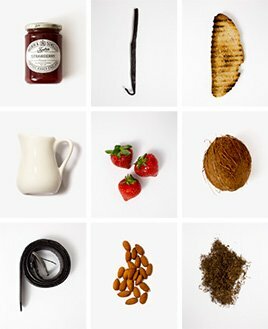 In 2008, there was no fruit with Cirsion character so they couldnt produce it. 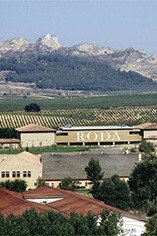 As with the rest of Rodas wines, its fermented in French oak vats, and malolactic is carried out in new French barrels where the wine matures for eight months. 2010 was a balanced year, with a longer ripening cycle and a delay in harvest of around 10 days compared with 2009. Its dark, opaque, almost black in color. The backward nose is unyielding and tight, and requires time and air to display an array of ripe black fruit, dark spices, licorice and some lactic hints. The palate is extremely balanced, with clean acidity, ultra-fine, velvety tannins that make it round, intense and tasty, powerful but yet light. This is a great Cirsion. 7,000 bottles were made. Drink 2014-2030. Our line-up of all the grand Bodegas based around the famous Estación at Haro is now complete. Roda is the youngest and possibly the most dynamic of this illustrious coterie, more in the ‘modern’ camp than their neighbours and favouring French over American oak. Their excellent vintages of 2004 and 2010 really underline the quality of their range.